Some of the greatest food and beverage discoveries were born out of either necessity or just good old fashioned curiosity. I mean seriously, who was the first guy to eat an oyster? Was it out of necessity to avoid starvation that he decided to eat the giant snot-like creature he found living in a rock he found growing in the mud of a coastal saltwater marsh, or was it a decision born of blatant human curiosity to see if he could eat the same stuff the otters were eating? Either way, people have been eating, drinking and mixing things – that arguably should or should not go together – since the beginning of time. That being said, one of my favorite things in the world is a good black and tan. You may recall another post I did some time ago, where out of necessity, I mixed together Natty Light and Steel Reserve to create what I called The Poor Man’s Black and Tan. Yes the original PMBT was created out of necessity due in part that I had been drinking and couldn’t drive myself to the store to retrieve the materials for a proper Black and Tan. The newest iteration of the PMBT however, was the culmination of centuries of the aforementioned human curiosity. In other words I had some Steel Reserve and a bottle of Yuengling Black and Tan and I wanted to see what would happen if I mixed the two. As I reached in my freezer I opted not for my usual vintage A&W Dog n Suds mug, but rather for my 32 oz Cheers mug I stole from the Cheers bar in the Cincinnati airport on my honeymoon. Assuming the Yuengling was the heaviest of the two, I poured it in first. I tried my best to use a big wooden spoon to marry the two in such a fashion as to render a distinct line of separation but now in retrospect think that a nice metal spoon would have been a better choice since the coarse wood caused more mixing by the roughly flowing beer than it prevented. Once both bottle and can had been emptied, what I was left with almost completely but not entirely resembled a genuine black and tan. There was a separation between the two which obviously could have been made more apparent with a little more patience and the proper equipment (as stated earlier) and there was a nice head of foam. I was amazed at the utter beauty of the cross-bred brew I had created but didn’t expect what came next. I’m not kidding. The Steel Reserve lightened the Yuengling Black and Tan up while the Yuengling B&T took away the bitterness and overall skunkiness of the Steel Reserve. I even tested it on my wife before telling her what it was and she said she really liked it. And as with any Steel Reserve creation it pack enough punch that after two I even thought Dane Cook was funny. I can say with all honesty that I’ll be drinking this version of the Poor Man’s Black and Tan on a regular basis. Try it for yourself and tell me what you think. If you can actually get it to separate nicely, take a picture and send it in and I’ll post it on the site. OMG! You are a genuis! I cannot wait to try this. I already know what each of these beers tastes like and I am positive that the two together would make a delicious black and tan. Heck, I always want that B/T YY to “grow some” and that Steel to turn it down a notch. Perfect. I’d drive to the store right now so I could try this, but I’ve already been into the Steel. Will check back once I try them together, whether I can manage the separation or not! To much tan on top black on bottom .May be good never tasted it . I prefer Guiness Black Lager over Schlaflys Pale Ale. 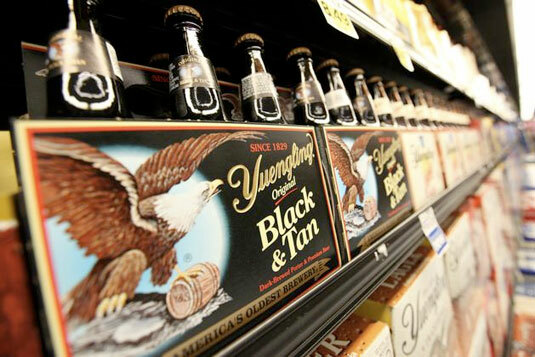 Black and Tan is by far the best brew to come out of Yuengling’s breweries.